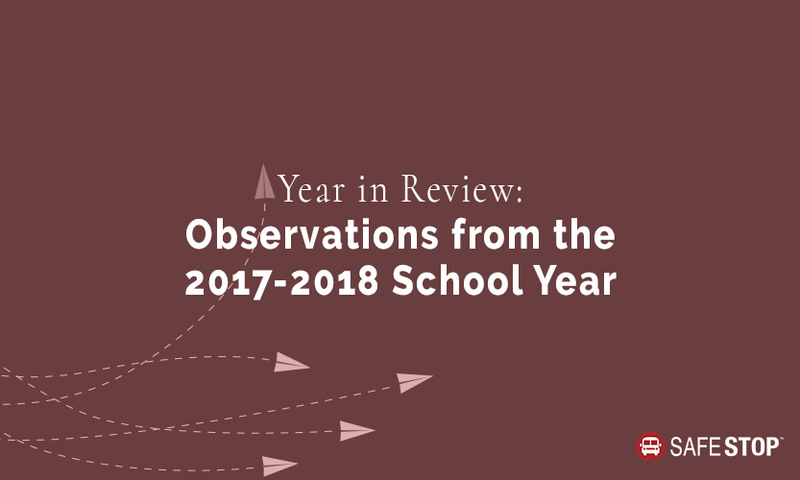 With the new school year just around the corner, it’s not only a great time for students, parents, and school districts to keep up their back-to-school preparation, but also to reflect on the technology and educational trends and learnings of this past 2017-2018 school year. As the industry’s leading school bus tracking app, this past year SafeStop enjoyed successes including geographic expansion, increased subscriber rates, and added features. Doubling in size for the fourth straight year, SafeStop has become the go-to bus tracking app for nearly 200 school districts across the U.S. and Canada, 75 of which have been added in the last 12 months. Looking back on the past year, here are some observations from the SafeStop Team. Across the country, it seems as though Transportation Directors and School Administrators aren’t getting the full benefit of the purchases they’re making, specifically their GPS purchases. GPS systems are extremely versatile and can be found in almost any industry sector, and are as important as ever for commercial school bus fleets. Utilizing signals from satellites to pinpoint locations and give directions to other places, GPS systems in the school transportation industry are most often used to track buses, map out the most efficient routes, and track specific incidents such as bus arrival times and delays. As beneficial as these actions are, many school districts are failing to utilize their GPS systems to the fullest with even greater cost-saving operations, such as excessive engine idling, preventive maintenance, driver attendance, and more. This means that important revenue is being wasted, as school districts are failing to extract the most value from their technology systems. While GPS systems and telematics, the actual vehicular data that comes from GPS, have been incorporated in the school bus industry for a decade, too many districts are failing to utilize them to their full potential, and are, in effect, limiting their opportunity to expand in terms of technology, efficiency, knowledge, and safety. This often happens when students transfer to or from schools mid-year, and the bus routes are not updated to accommodate the change. Thus, there are opportunities to make significant changes during the school year where routes can be analyzed and optimized on a quarterly basis, so school districts can get the most out of what they’re spending. To do this, SafeStop integrates with a variety of both GPS and routing vendors, which also helps SafeStop clients get better use out of these systems. The impacts of school bus route optimization are far reaching, from protecting the safety of passengers and monitoring ridership time, to eliminating dangerous greenhouse gasses, controlling driver shortages, and ultimately saving money. We love that parents, students and school districts alike are embracing and understanding the amount of work that needs to go into being prepared for a new school year in terms of transportation. Being prepared when it comes to transportation means taking into account things like routes, data and information, technology, driver performance, driver training, and a host of other details. This past year, as more and more school districts have begun utilizing SafeStop, they’re beginning to reap the benefits and physically see the fruits of their labor, meaning a more consistent dedication to making student transportation as safe and as efficient as possible. For example, all too often, parents are unaware of school delays, closings, or other interruptions. To alleviate this, SafeStop works collaboratively between the school district and its transportation providers, meaning parents can receive service notifications within the SafeStop app about their child’s bus. Not only does this allow important school transportation information to be easily accessible, it minimizes phone calls to the transportation department or school administration from concerned parents who were previously left in the dark due to a lack of communication. Every transportation department in school districts across America will agree that priority No. 1 is student safety. This can be achieved in many ways, especially as new high-tech business capabilities are introduced in the marketplace. Now more than ever, transportation technology is moving to improve learning, safety, and operational effectiveness for K-12 students everyday. Technology provides knowledge, safety, and productivity, and is being purposefully embraced for the better.